Now available in Antique Gray! An Italian credenza of exceptional beauty, our exclusive wine and spirits bar is fashioned by master cabinetmakers in Tuscany from select walnut hardwoods and veneers. Elegant in a dark espresso called 'noce piu', each side features sliding pocket doors that open to multi-functional compartments, the left with pull-out shelves deep enough for standing spirits bottles, the shelves on both sides removable and can hold our 28-bottle Silent wine fridge (28 bottle wine fridge not included). 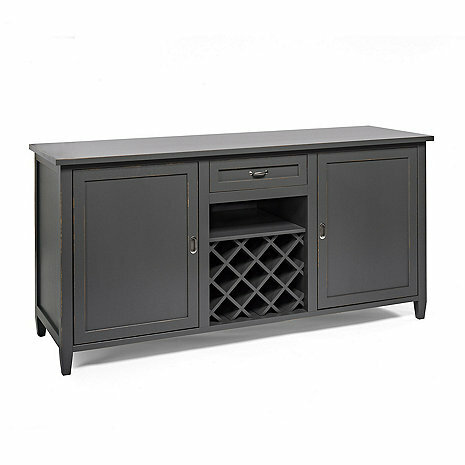 The center features a removable 13 bottle bottle wine rack, shelf for glassware and a drawer for a bevy of bar tools. Hand-finished and adorned with brushed nickel hardware. The Left compartment has 2 sliding/removable shelves, perfect for storing spirits and bar accessories.